Sacrificing liquidity in return for additional yield can be attractive if the compensation is sufficient and the time horizon of capital is appropriate. But corporate bond markets are currently not providing sufficient compensation for growing illiquidity risk. Credit spreads represent the extra yield investors receive for holding bonds issued by corporates, that typically have higher default risk than government bonds. However, they do not compensate for default risk alone. In fact, it is well established in academic literature and market experience that default risk is not the major driver of investment grade (IG) credit returns and historical data shows that IG credit spreads consistently over-compensate relative to actual default losses. However, this excess compensation is not free money. Rather it can be thought of as a credit risk premium that compensates investors for the other risks, beyond default risk, that they are exposed to. These other risks are often more important drivers of credit spreads than default risk. Of these other risks, an important component is illiquidity risk - the risk that a credit investor is unable to sell a bond holding in a timely manner, without incurring punitive costs. Even long-term investors value liquidity, in order to maintain flexibility of asset allocation and that desire is often highest at times of market stress, when liquidity is most tested. It’s generally underappreciated just how much corporate bond trading liquidity has deteriorated and this is happening at a time when the compensation for taking this liquidity risk has declined to historic lows. Sacrificing liquidity in return for additional yield can be an attractive source of excess return if the compensation for illiquidity risk is attractive and the investor has the right time horizon of capital. Currently, corporate bond markets are not offering attractive compensation for illiquidity and a growing segment of the market (e.g. corporate bond ETF’s) may not have the right time horizon of capital. 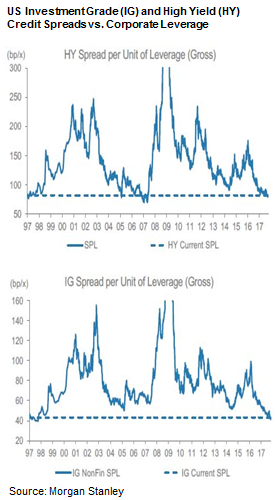 With credit spreads back near historic tights, corporate bond investors are now left taking more liquidity and credit risk for less return, as the charts adjacent show. 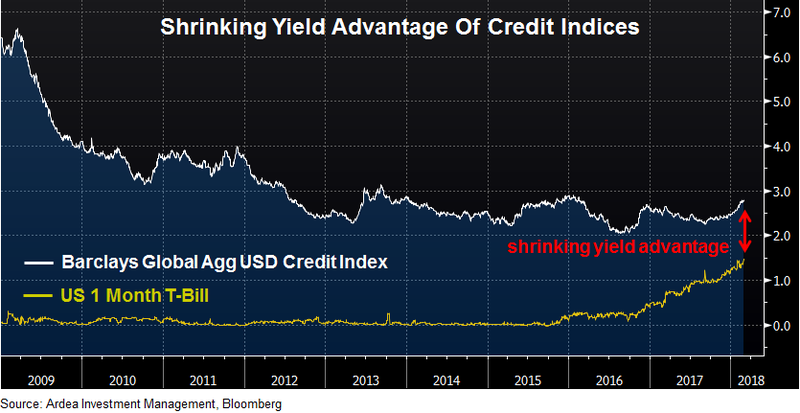 Parts of the global credit market are now barely compensating for default risk, let alone offering an additional risk premium for illiquidity. For example, in November 2017 a BBB rated French company (Veolia Environment) priced a three year bond at a negative yield of -0.026%. You read that correctly, a company rated just two notches above junk was being paid by investors to borrow money from them. This was quite a result from the company’s perspective. 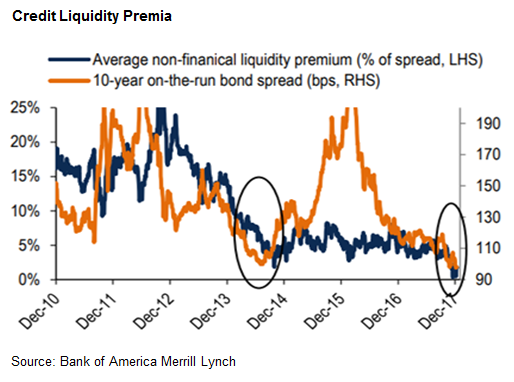 While credit spreads are now mostly back to pre-GFC levels, corporate bond trading liquidity has got a lot worse. 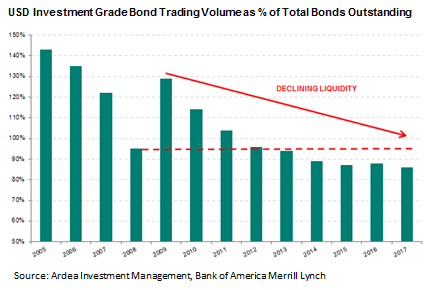 As the volume of bonds outstanding has significantly increased since 2008, relative trading volumes have decreased and this impairment in liquidity is structural in nature as it has been caused by regulatory constraints on bank balance sheets. Recall that the corporate bond market is not exchange traded and is therefore completely reliant on bank intermediaries (market makers) to facilitate risk transfer. Regulation has simultaneously decreased the ability of bank balance sheets to hold bond inventories and also increased their cost of capital, leading to structural impairment of market makers’ ability to supply liquidity. The New York Federal Reserve Bank estimates that banks currently only hold about 20% of their pre-crisis bond inventories. Simply looking at average bid-offer spreads of actual trades that have taken place, as most liquidity studies do, fails to differentiate between situations where an investor needs to trade and therefore needs liquidity vs. where an investor’s interest happens to suit a position that a dealer already has and is therefore actually providing liquidity. A Washington Federal Reserve study found that in situations where investors truly need liquidity, they are paying 35-50% higher bid/offer spreads compared to the pre-financial crisis period and it is worth noting this has occurred against a very favourable backdrop of rallying credit markets. Put another way, liquidity studies based on transaction data only cover the trades that actually took place and ignore those that never happened. It’s the latter that are most relevant when assessing the true liquidity of a market because it’s the trades that fail to execute that evidence poor liquidity. Perhaps one hard data metric which captures this dynamic calculates bond trading volumes as a proportion of the total market size. If liquidity was consistent, trading volumes should rise as the market grows such that this proportion remains constant. The adjacent chart shows this has clearly not been the case. Trading volumes in US investment grade corporate bonds, which are the most liquid segment of corporate bond markets, as a percentage of total bonds outstanding has declined to lower levels than during the financial crisis in 2008. What could trigger an outflow from corporate bonds markets? A turn in the credit cycle is the obvious catalyst but credit fundamentals are generally still OK, albeit weakening. A more imminent and less obvious catalyst could simply be rising interest rates. As of March quarter end, the yield on 1 month US Treasury Bills reached 1.62%. Having minimal credit or interest rate risk (the occasional government shutdown drama aside), this is close to what most investors would consider a risk free rate of return. As the following chart shows, higher risk free rates are a big shift from what investors had become accustomed to in the post financial crisis world, with almost half that move higher taking place in just the past 6 months. For investors with absolute yield targets, as risk-free rates rise, their incentive to keep reaching for yield in higher risk assets falls, which then triggers selling of higher yielding assets as the ‘reach for yield’ dynamic reverses. It’s no secret that the ultra-loose monetary policy adopted by central banks since the financial crisis has triggered an unprecedented reach for yield, which has resulted in significant yield compression between risky assets and risk-free benchmarks. Put another way, investors have been forced to accept less and less return in exchange for taking risk and the following chart illustrates how the yield pick-up from switching into higher risk credit assets is disappearing. 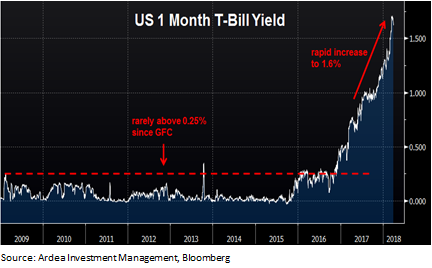 The chart compares the yield on 1-month US T-Bills to the Barclays Global Aggregate USD Credit Index. While the former has minimal interest rate risk, the latter comes with 6.5 years of interest rate duration, which means for every 1% increase in interest rates the index would incur a 6.5% capital loss. While the former has minimal credit risk, the latter includes securities with material credit risk, including a 12-year junk rated bond issued by Russia in its top 15 holdings. The yield differential between the two has decreased to just 1.17%. So, reaching out the risk spectrum is yielding less and less in return, and begs the question of whether this will trigger large outflows from credit beta products. There is already some evidence that outflows from credit are picking up. US high yield credit has now had eight consecutive weeks of outflow, while US investment grade credit recently recorded the first net outflow in over a year. US junk bond ETF’s had their largest net redemption on record. But overall the outflows from credit as a whole remain very modest. Nonetheless, over the first quarter of this year corporate bonds experienced their worst spread widening since the China growth scare in early 2016. While the magnitude of the move was smaller than in 2016 it’s coming off a lower base, meaning there is now a smaller spread cushion to buffer this type of volatility. Perhaps this is just a temporary demand/supply imbalance, but if outflows from credit were to gain momentum it’s unclear how credit markets, already suffering from structurally impaired liquidity, will handle it. As the early movers soak up what little liquidity is left, investors who had been reaching for yield in credit and now seeking the exit may be unpleasantly surprised at just how illiquid corporate bond markets have become. With credit spreads at current levels you’re hardly being paid to take that risk. Fortunately, fixed income offers a broad range of alternative return sources that can deliver attractive returns without resorting to credit risk, while still retaining a defensive risk profile.